Originally from Canada, Iceberg Vodka recently made its way to Texas, as of the first of this month. It has an incredible story to tell, too. The vodka is created from pure Canadian icebergs. 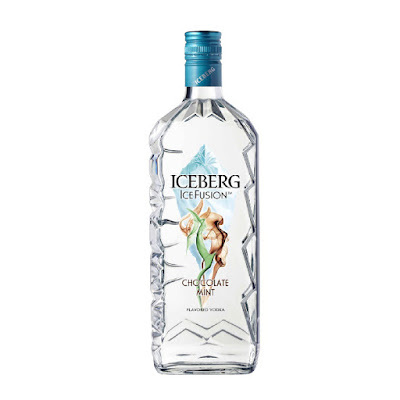 Since 1995, Iceberg Vodka has been crafting small batches from icebergs attained at in Iceberg Alley. These icebergs are 20,000 old. This is the purest water on our planet. To ensure that your 'berg is at its coldest, the Canadian Maple leaf at the apex of the front label will turns pinkish red when it's at the right temperature. Pour Chocolate Mint IceFusion into an Irish mug. Top with coffee. Place whipped cream on top of the drink. Add some coffee liqueur to top of whipped cream. Place mint leaf at the very top of whipped cream. Pour all ingredients into a shaker filled with ice. Shake well, then strain into a cocktail glass. Garnish with a sprig of mint. It available also garnish with a chocolate stick.